The beautiful, iron-willed Wild Ginger is only in elementary school when we first meet her, but already she has been singled out by the Red Guards for her "foreign-colored eyes." Her classmate Maple is also a target of persecution. It is through the quieter, more skeptical Maple, a less than ardent Maoist whose father is languishing in prison for a minor crime, that we see this story to its tragic end. The Red Guards have branded Wild Ginger's deceased father a traitor and eventually drive her mother to a gruesome suicide, but she fervently embraces Maoism to save her spirit. She rises quickly through the ranks and is held up as a national model for Maoism. Wild Ginger now has everything, even a young man who vies for her heart. But Mao's prohibition on romantic love places her in an untenable position. Into this sexually charged situation steps Maple, creating an uneasy triangle that Min has portrayed with keen pychological insight and her characteristic gift for lyrical eroticism. 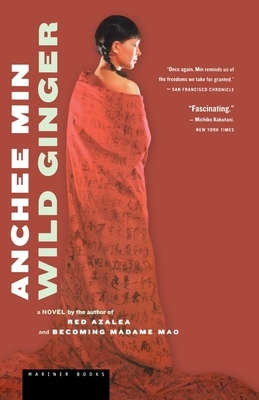 In Anchee Min's previous three books she returned again and again to the devastating experience of the Cultural Revolution, which defined her youth. Here, in this slim but powerful novel, she gives us a moving story that goes closer to the core of that experience than anything she has written before, and brilliantly delineates the pychological and sexual perversion of those times. Ultimately, WILD GINGER has the clean lines of a parable, the poignancy of a coming-of-age novel, the sexiness of a French blue movie, and the sadness of a truly tragic love story.